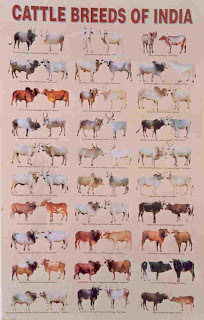 Nimari cattle show a mixture of Gir and Khillari (Tapi Valley strain) breeds. The breed has taken the coloration from the Gir as well as its massiveness of frame and the convexity of the forehead. It has acquired the hardiness, agility and temper of the Khillari with the formation of feet and occasional carroty color of the muzzle and hooves. Starting from Barwani and Khargone districts of Madhyabarat, the breed spreads into Khandwa, and parts of Harda of Madhya Pradesh. It is also bred in adjacent parts of Bombay State. In the Satpura ranges of Madhya Pradesh there is a strain of cattle known as Khamla, which is much smaller in size but very akin to the Nimari. In addition, the Khamgaon strain found in Berar may be an offshoot of the Nimari. This breed of cattle is prized for draft work, though few animals show evidence of fair milking qualities. The animals are well-proportioned and compact in appearance. In general they are red in color with large splashes of white on various parts of the body. In the Khamgaon strain the color is occasionally black or light red and white. In the Khamla strain it is red with a violet tinge and white or yellow and white. The head is moderately long with a somewhat bulging forehead, it is carried alertly and gives the animals a graceful appearance. The horns usually emerge in a backward direction from the outer angles of the poll, somewhat in the same manner as in Gir cattle, turning upwards and outwards and finally backwards at the points. Occasionally, the horns are also like the Khillaris in size and shape, with copper color and pointed. The ears are moderately long and wide and are not pendulous. the muzzle in many animals is either copper-colored or amber-colored. The body is long, with a straight back and moderately arched ribs with the quarters usually drooping to some extent. There is a tendency to prominent hips common to the Gir. The dewlap and sheath are moderately developed, though the sheath is apt to be pendulous. The hump in bulls is well-developed and apt to be hanging at times. The limbs are straight and clean and the tail is long and thin with a black switch reaching to the ground. Hooves of the animals are strong and can stand rough wear on stony ground. The skin is fine and slightly loose. The cows usually have well-developed udders.